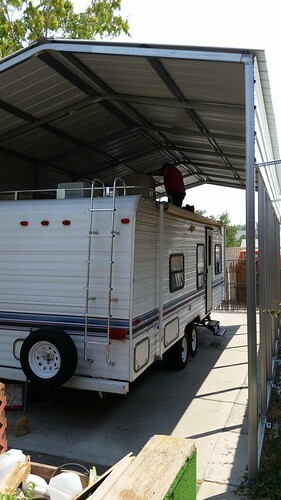 A couple of days ago, Lisa went up on the roof of the travel trailer to examine the air conditioning unit in preparation for the attempted recharge once all of the parts and coolant arrive. I've had people ask why we built such a tall shelter when the trailer could easily fit under something much shorter. This picture shows you why. 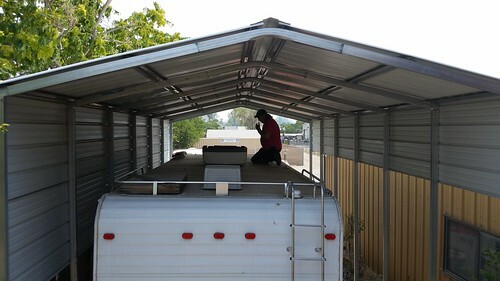 While of course we could have built it much shorter so that the trailer just barely fit, it would be impossible to work on the roof without pulling it out from under the shelter. In Fernley's weather conditions, that would be a very bad idea. Lisa can work under the shelter, out of the sun, and can almost stand up to full height at the peak of the shelter. Here, she has removed the shroud covering the AC unit. She then handed it down to me and had me put it in the garage, lest the wind come along and blow it off the roof. As it happens, it started getting windy right after she called me over to come collect it and put it away for safety. There was a lot of dust in the AC unit. Lisa here is holding a board with giant dust bunnies on it as she cleaned out the dust. 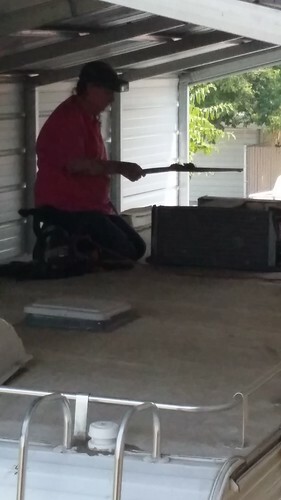 She used the weed blower to blow lots of dust out of the unit. 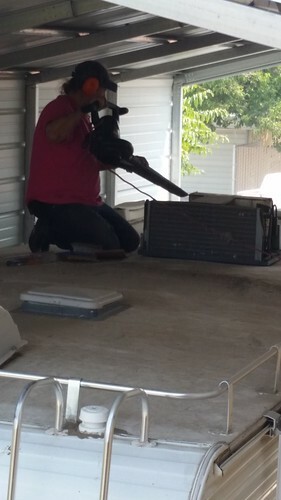 This photo doesn't show it well, but a big cloud of dust rose out of the air conditioner when she turned on the blower. After cleaning all of the dust out of the AC, it ran much better and stopped blowing the circuit breaker. It can keep the trailer habitable, but it still isn't putting out full cool. However, assuming the unit continues to behave reasonably, Lisa is now thinking of waiting until we get back from Worldcon before attempting the recharge. None of this work would be possible without the shelter because weather has had highs close to 40°C here even in the shade, and in the direct sun it would be much worse. Also, the shade of the shelter means that what cooling the AC can do is about sufficient to get by until more can be done.